As I get ready for the next Coach The Life Coach course starting on Sunday, please enjoy this guest post from Mihai offering some sound and easy to implement advice to lift your mood. In life, there will be moments when you will feel down or feel like you don’t know what else to do. I’ve experienced this so many times in my life and I’ve learned a few things that can help when in those situations. The first thing you need to understand is to never make a decision while you’re feeling down, stressed or stuck. That’s why we have friends, to be there for us when we need it most. You don’t have to go through anything all by yourself. Accept help! 99.9% of the time you can’t think about all the possibilities, that’s why talking to a person you trust can expose you to new ways of looking at your situation and maybe even realize that it’s not as bad as you thought it is. If it can help with depression, it can help you as well when you’re feeling stuck or don’t know what else to do. It’s very important though to be in nature or with as little traffic as possible. Take a moment to hear the sounds around you (which are hopefully from birds and trees), be in the present moment and enjoy. Anything else can wait. Something magical happens when you connect with nature and with the sun, you get more energy and you will higher your vibration. And trust me, the world won’t grind to a halt in your absence. So your best friend couldn’t answer the phone and your wife is busy at work, what do you do? Well, you can write things down to start with. Take a clean sheet of paper and write down everything that crosses your mind in no particular order. Just get them out of your head so you can feel lighter and think better about your situation. Writing has a healing side to it and there are different studies that prove the healing benefits of writing about your struggles, feelings and even secrets. Dr. James Pennebaker has been telling his patients the following exercise for more than 20 years : write about an emotional upheaval for 15 to 20 minutes per day for four consecutive days. Many have seen their immune system strengthen, were able to better accept events from their past and felt much lighter. I write about this exercise a lot, but only because it’s so powerful. This exercise will switch your focus from what you don’t want to what you truly want. It may feel a bit hard at the beginning, but stick to it and find at least 10 things for each category. How to do this exercise? Write down everything you would BE, DO or HAVE if money was not a problem for you, if you could have all the money in the world or if you couldn’t fail. Having a playlist of music that you adore, that motivates you and makes you feel strong, is a very wise thing. It’s no secret that music can make us feel a certain way based on, mostly, the memories that come with it – so choose carefully because it can also put you in a sad/depressing mood. I like to listen to AC/DC’s Thunderstruck for example or Bastille – Pompei. Tim’s Note: I’m not an AC?DC rock fan, but Thunderstruck has to have one of the greatest intros of all time! Kindness is one of the purest things on planet earth and can instantly lift your energy. Because you don’t focus on yourself anymore, you focus on someone else, which makes you forget about your situation, and often times when you do remember about it, you will not see it as bad because you’re at a different frequency. Kindness also builds up good karma which might even turn your whole situation around! Do you know another thing that is healing too? Laughing! A good laugh might be the best “medicine” and the wisest thing you can do if you are feeling stuck and it was proven by research. Have your own list of funny movies or just short Youtube videos that will make you laugh anytime of the day. I like to watch the Ellen Show or Friends for example. Tim’s Note: There’s not a day goes by when I don’t watch or listen to some comedy! No one likes to feel stuck or sad, but it happens sometimes and we just need to learn how to better deal with those moments to not let them take over our whole world. Take a moment to observe which of the above suggestions truly resonate with you and be open to finding other ways in which you can make yourself feel better that were effective in the past. Would you try any of the suggestions on a bad day? How would you further tweak it to better fit your needs? Let me know in the comments section below! Mihai Herman is the founder of Male-Extravaganza.com where he blogs since 2010 and teaches men how to be happy, kind and successful. Mihai is also a business coach specialized on the online world. I usually just talk to a friend. Solid advice! Wonderful articles in this post it’s very beneficial for me. Thanks to share this post. Nice points, Mihai! And nice notes, too, Tim. Exactly! I never eat my lunch whilst I’m working and that is often when I will watch something on YouTube. I recommend you have a few shows that you watch – that will make it easier and faster. For example, I follow Ellen Show and Jimmy Fallon – they post a few videos every day of the week and it’s enough to life your mood. The two shows combined should give you about half an hour of fun and inspiration (Ellen). I also love about Ellen because besides being funny, she inspired me so much most of the times with the kindness acts that she does. If you like Friends or Seinfeld, invest in Netflix or Hulu – both tv shows have more than 200 episodes which will give you more than half a year of laughter without you having to search for something different every day. When there’s nothing left to watch, I rent movies and I only watch about 20-30 minutes every time I eat. I appreciate all the mindfulness eating, but it’s not working for me, I love to watch something while I eat and if that makes me feel great, I go with it. Yep I love the helping others too. I think it has to be in a way that is meaningful to us as we’re not all cut out to work in soup kitchens or working for the Samaritans, but there are 1,001 different ways we can do it. No woo-woo. No BS. 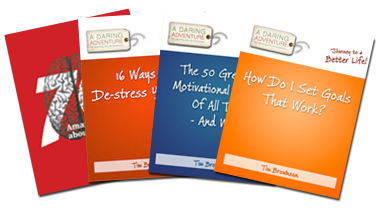 Science-based tips and updates to help you get unstuck and live better through my four free books! I'M READY FOR A BETTER LIFE! Check out my other site, Coach The Life Coach, for more information on the most comprehensive life coaching certification course around! I'm glad you're ready to finally get unstuck. Call me at 407-334-4692, or email me from the contact page to get started. GET ALL FOUR BOOKS YOURS FREE! * I never share your e-mail with third parties. YOU'RE MOMENTS AWAY FROM A BETTER LIFE!